Aesthetics: The SaharaCase Classic is great for those who want protection but do not want all that bulk that comes in an OtterBox. We found the design to be unique and beautifully slim. It’s design makes the case stand out in a crowded market. Rating: 4 out of 5 in aesthetics. Ergonomics: Its slim and sleek design makes it lighter and easier to carry in your hand, pocket or bag. It also features non-slip grip, which helps prevent users from dropping their device. The case features precision cutouts for buttons and ports, which helps guide your fingers to the buttons allowing for easy access when adjusting volume, powering down or plugging in. Rating: 5 out of 5 in ergonomics. Protection: Although the case looks thin, the Classic case does not sacrifice protection. 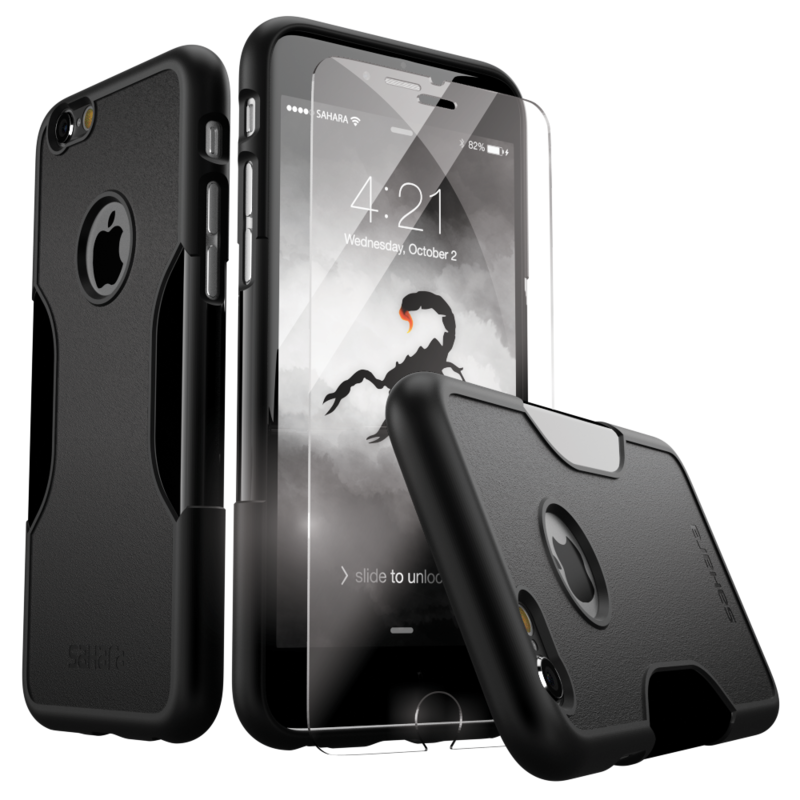 The SaharaCase Classic, designed by cell phone industry repair experts, features shock-absorbing TPU edges and a hard plastic backing for maximum protection of your device. What’s more, it is the only case that is packaged with a tempered glass screen protector. The tempered glass is built to withstand heavy impact while allowing the user full touch-sensitivity. Since most of the damage to the iPhone is usually the cracked screen, bundling of the case and the tempered glass screen protector really made SaharaCase stand out from the competition. Rating: 5 out of 5 in protection. Price: Priced at $21.95, the SaharaCase iPhone 6 Case Classic is a steal. Not only do you get the case for half the price of most popular iPhone 6 cases, but you also get a tempered glass screen protector and various other tools for easy installation. Rating: 5.0 out of 5 in pricing. Customer Reviews: Most customers that bought a SaharaCase say they love it. 72% gave it an A grade. Some have complained about the difficulty installing the tempered glass. The new SaharaCase packaging is beginning to include a tempered glass installation tool that should address the concern. The company’s dedication to providing quality products and excellent customer service make the SaharaCase Classic our top iPhone 6/6s case of 2016. Rating: 4 out of 5 in reviews.